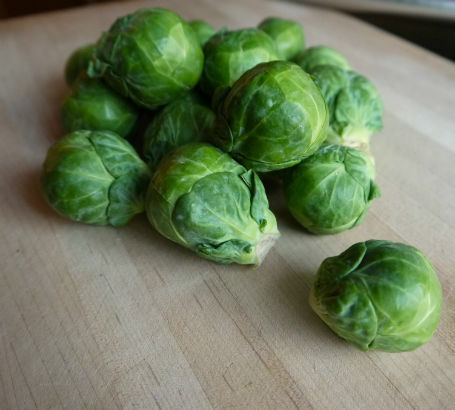 Brussel sprouts are one of those vegetables that get a bad rap. Poll a group of people and some will say “I love them” and some will give you a shiver and say “yuck.” If you are partial to any type of cabbage you will most likely enjoy Brussel sprouts. They hail from the same cultivar family, and are cousins to broccoli and cauliflower. The key, as with anything coming out of your kitchen, is to cook them properly. Mushy army green globes are not good eats. A quick cook in a really hot oven just might be the ticket for you to give the Brussel sprout another look. First written evidence of this powerhouse vegetable seems to have popped up in the 16th century, although some believe they came on the scene in the 14th century in the area now known as Brussels, hence the name! French settlers brought them to our continent in the late 18th century, and Jefferson notes growning them in Monticello. In the 1920’s they made their way to California, who is now our largest producer. They are high in Vitamins C, A and B6 and low in calories, fat and sodium. Look for firm dark green Brussel sprouts free from black marks or holes. Store them unwashed and in a plastic bag in the refrigerator. Brussel sprouts will last for four to five days while increasing in flavor. Just searching cook books or Googling “Brussel sprouts” and you will find pages of recipes. Generally they can be baked, roasted, pureed or eaten raw in a salad. My favorite way to prepare them is roasting in a very hot oven with bits of bacon or pancetta. This past weekend on my staple run at Costco I noticed they were selling farro. Generally you only find this in Italian specialty stores or Whole Foods. If you’ve never tried this grain, now is a perfect opportunity. 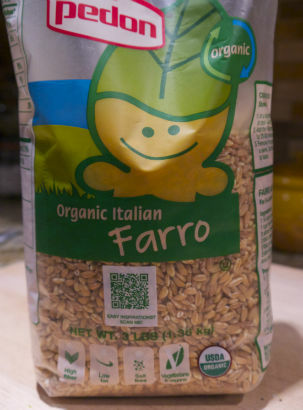 Farro is an ancient grain that made its way to Tuscany via the Egyptian. It has a nice nutty flavor when cooked, so a perfect compliment to Brussel sprouts which also take on a nutty flavor when roasted. 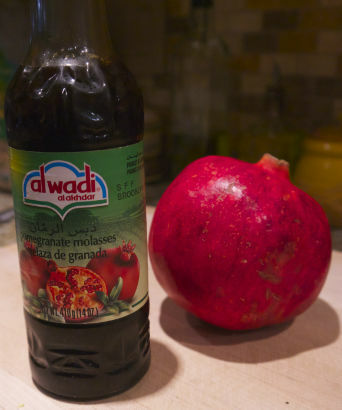 Pomegranates are everywhere now and who can resist their sweet tart flavor? Cleaning them is a snap. 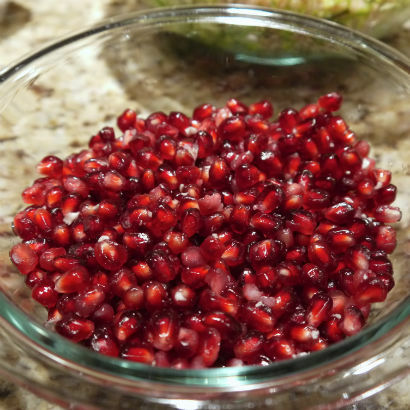 Click this link to see my easy method for cleaning pomegranates. 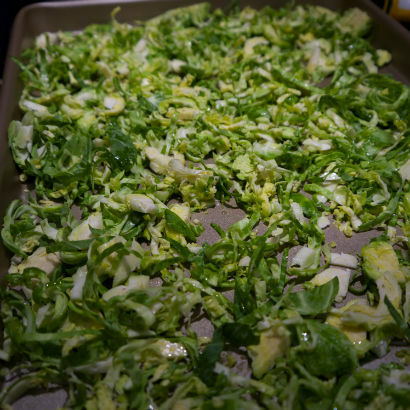 Creating this dish is relatively simple: After slicing the Brussel sprouts thinly toss them with a little olive oil and seasoning and roast very quickly on high heat. For the vinaigrette I used pomegranate molasses. This is another fantastic ingredient you should have in your ‘fridge. It’s great drizzled over roasted foods and also as part of a dressing. You can find it at most specialty food and vegetable markets like Whole Foods, Tarry Market and Apple Farm. Bringing all these wonderful ingredients together, plus a sprinkling of hazelnuts, created a really delicious salad. 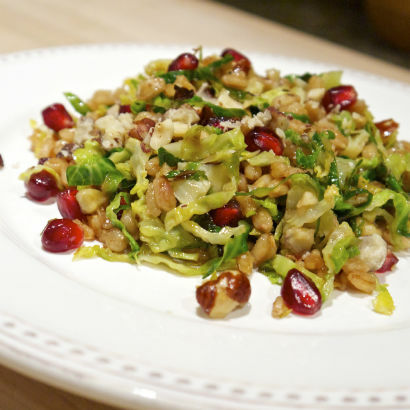 Click this link to see my recipe for Brussel Sprouts, Farro and Pomegranate Salad. What better way to keep it seasonal, bright and crunchy? I hope this give those of you on the fence the inspiration to you give the Brussel sprout a try.